IDnow, a company nominated in the 2018 FinTech50 listing of the hottest European start-up businesses, has launched the next generation of its Identity Verification-as-a-Service platform that will enable companies to verify the identities of more than seven billion potential customers online easily and securely, and in compliance with regulatory Know Your Customer (KYC) requirements across Europe and beyond. The IDnow platform – which is already trusted by several hundred companies across Europe, including UBS, Commerzbank and Telefonica – has been significantly enhanced with biometric, computer vision and security fraud detection technologies that gives it “the most extensive ID verification capabilities in the market” able to meet more identity verification use cases than any other platform. The IDnow platform meets the high security and fraud detection requirements of strictly regulated environments for financial services and telecommunications sectors in countries like Germany, Switzerland and other European countries and is fully compliant with all relevant regulations and directives such as the AML regulation, eIDAS, the General Data Protection Regulation and PSD2. In addition, the platform meets the business requirements for speedy and simple workflows that reduce customer on-boarding friction for non-regulated or lightly regulated sectors such as mobility, travel, recruitment and the sharing economy. The IDnow platform can be easily integrated into a company’s service application and customers can complete an identification check quickly and easily from a smart phone. For industries or countries with more stringent security regulations, the platform will continue to offer video chat-based identity verification. An intelligent video surveillance system has been developed to improve passenger safety on public transport. SharpView Rugged from technology developer EyeLynx has been approved to stringent EU environmental standards EN50121, 50155 and 61373 for use on rail carriages and emergency vehicles. Military grade units complying with MIL-STD-810 are available on request. SharpView Rugged consists of SharpView Manager Professional security management software and the SVR-5716NR NVR, which is a rugged unit with 16 inputs enabled, eight of which are direct Power over Ethernet (PoE) for HD cameras and up to 4 Tb hard disk storage drives. Storage is also possible by way of external USB drives. SharpView systems can record and manage multi-megapixel and HD video evidence from an unlimited number of CCTV cameras. Alarms are also recorded from other security devices, such as facial recognition, intruder alarm and fire sensors. Built on the latest Enterprise class Linux operating system, the SharpView recording engine “delivers the fastest storage and retrieval performance” in the industry. All units record network IP video of any resolution, frame rate and compression formats including M-JPEG, MPEG-4 and H.264. It supports a variety of digital I/O and devices connected over USB, Ethernet and RS 232/422/485. GPS tracking and wireless connectivity is also supported. The WCIT Entrepreneurs Forum has announced the winners of the fifth annual WCIT Enterprise Awards. The awards, which were presented at a celebratory dinner held at The Plaisterers’ Hall in London, recognise the achievements of individuals who have demonstrated vision, growth, innovation, funding, use or resources, strategy, execution, ambition and determination to succeed. 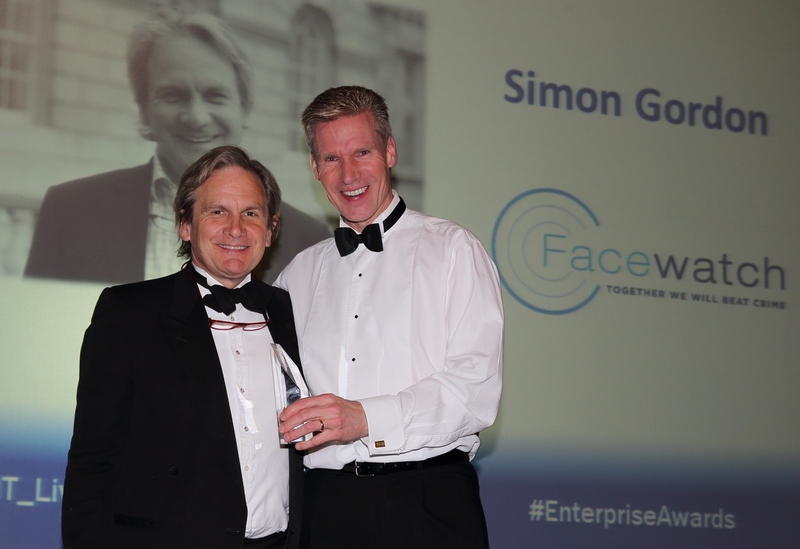 Simon Gordon – who founded Facewatch back in March 2010 when he decided that he needed to do something about the problem of pickpockets stealing from customers in his family-owned London business Gordon’s Wine Bar – was bestowed with the prestigious Judges Award. From its inception as a simple crime reporting tool, Facewatch has now evolved into a multi-functional crime reporting platform that enables businesses, the police service and members of the public to work together when it comes to reducing high volume, low-level acquisitive crime (such as handbag, wallet or mobile phone theft). Functionality of the Facewatch solution includes data sharing and analysis tools, CCTV and image capture (including facial recognition software from partners), crime analysis tools and secure communication within groups. This year’s WCIT Enterprise Awards were held in association with tech UK and sponsored by The Sage Group plc, TechMarketView, Cobalt Corporate Finance, GFT and Smith & Williamson. The event also featured a keynote speech from Stephen Kelly, CEO of The Sage Group plc. Kelly’s a passionate champion of entrepreneurs and small businesses and promoting their role in driving economic growth. Also attending the awards ceremony were several other key industry professionals including Steve Garnett (chairman for the EMEA region at salesforce.com), Mike Tobin, the co-founder of Telecity and Richard Holway (chairman of TechMarketView).